A grandry corpuscle (corpusculum discoidale multicellulare) is an encapsuled mechanoreceptor that occurs in the dermis of the beak of aquatic birds (and kiwis) only. Grandry corpuscles are most numerous in the maxillary and mandibulary nail at the tip of the beak, where they form the bill tip organ. 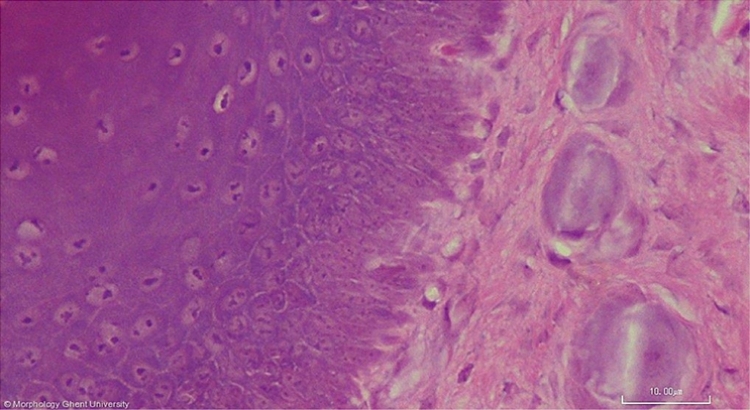 The bill tip organ consists of one or more rows of connective tissue papillae that project through the thick horn of the ramphotheca and are filled with a complex arrangement of Grandry and Herbst corpuscles. Grandry corpuscles are regarded as encapsuled Merkel cells. They respond to pressure as rapidly adapting mechanoreceptors.